With a flying start from Lynn Pearson and help from Bev Parker, Bob Hazelhurst and Duncan Nimmo. The Tile and Architectural Ceramics Society is creating a gazetteer of architectural ceramics in the UK. To find out more about it, click here to go to their splendid web site. The project is being carried out by Lynn Pearson at the University of Wolverhampton. Having fallen for the request on the TACS web site to report any further examples, I started noticing terra cotta all over the place - and just a few tiles. I have reported all of these to Lynn; but I thought we might as well have our own list here - go to the bottom of this page for the link to it. I started by stealing 20 entries from Lynn's list. I omit from the record here most buildings which have only very limited amounts of terracotta on them. I have also omitted details of the houses with tiles (usually porch tiles) which might be vulnerable to art thieves. Being a terracotta spotter is fun. If you join in and find any more examples within the city please contact the webmaster. Or contact Lynn Pearson, for anything you find elsewhere and which is not in the TACS gazetteer. 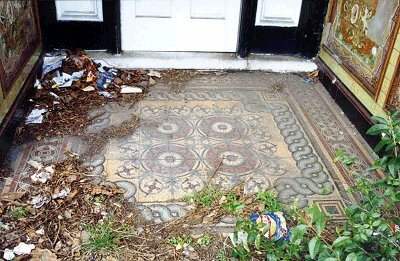 Porch tiles and a fine mosaic floor lie abandoned.